While I may be a little on the young side (only just) to have been a Beatlemaniac or have been a screaming fan for a 70's teen idol, I can so relate to those feelings and the special childhood afforded by the 1960's and 1970's. Flash forward a couple of ... decades ... and we have Sandy Fairfax, more than a little tarnished 38 year old 'fair-haired boy'. 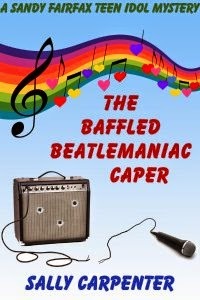 The first thing that struck me about "Baffled Beatlemaniac" was the fact that it felt very 'real'. I could definitely see something like this happening to me or someone close to me. Former (child) stars keep chasing that elusive dream of fame, hoping the squeeze the last little drop of celebrity out of the game called life. I loved the multiple layers of this book as well. You have a small Beatles fanvention, with a name star from relatively the same era for a headliner. Mix in a little alcohol, some big (and all-to-fragile) egos, fans believing the stories they have made up in their mind about their idols, rabid memorabilia collectors and you can see how a supposedly quiet weekend in a Midwestern town could turn into a huge indoor concert where you are standing right in front of speakers that are bigger than you are. "Did the victim do or say anything that might identify the murderer? “It’s a song.” Bunny stepped up beside us as she closed the zipper on the pouch that hung from her waist. “By John Lennon and Paul McCartney. Paul sings lead. It’s on disc one, side two, track five of The Beatles’ 1968 double record, ‘White Album,’ which isn’t the name, but everyone calls it that because it was issued in a plain white cover with no artwork. I have a 1978 French import reissue with the records in white vinyl.”Braxton stared at her, too stunned to take notes, but I took it in stride. Fans possess encyclopedia knowledge of the minutest trivia. Thanks for the great review! I had fun dabbling in nostalgia as I was writing the book.